This dress is BRILLIANT (hence it’s name) and it is hands-down the fabric (from none other than The Fabric Store!) that makes it so exceptional. I am unsure of the fiber content of this textile so I wont even speculate about it here, but I can tell you how it handles and looks in person: it has a significant amount of body, is sturdy but soft to the touch (not scratchy like some textiles of it’s ilk), it holds its shape well with no folding or creasing, and it has a very delicate sheen on its surface without looking glittery or shiny. This is the first panel fabric that I have ever sewn and I couldn’t have chosen a better material to start with, but, like many memorable relationships, I’m not sure if I chose this fabric or it chose me! 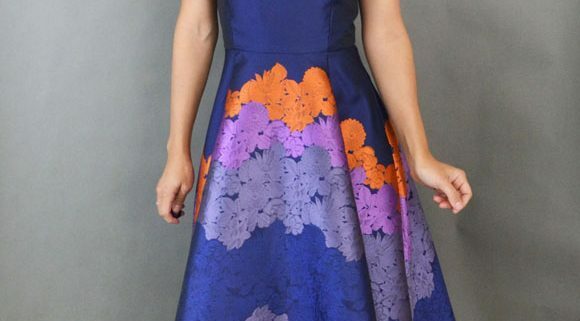 It grabbed my attention from across the store because of the bright orange flowers and interesting color combination- I would never imagine that lavender, orange and deep blue would work so well together, but I guess that’s why I’m not a fabric designer! HA! I had no idea what I would make with this fabric when it came home with me, but I knew my choices of pattern would be narrowed down considerably because of the unique qualities of the print and the hand. The fabric is stable without being crispy and it also has a lot of volume, so drape-y, flowy and gathered designs were out of the question. The panel flowers also needed to be taken into consideration- I needed a pattern that would let the bright print of the flowers take center stage. I rifled through my pinterest boards for pattern inspiration but didn’t find anything that grabbed me, so on a whim I decided to take a look at the By Hand London catalogue. 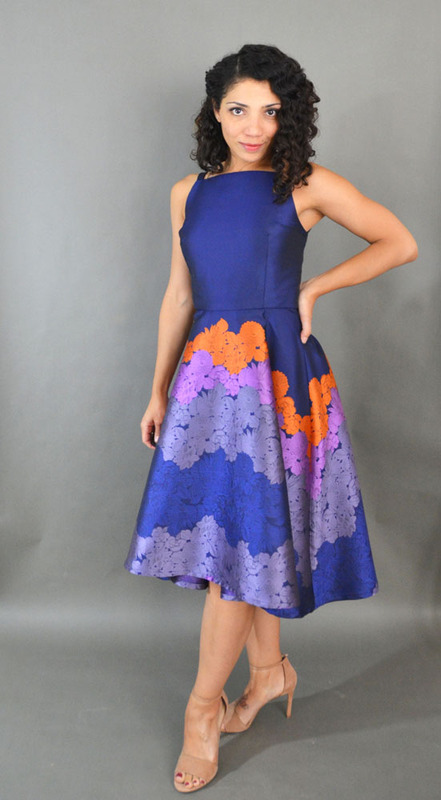 I had most recently made the Anna dress to tremendous success and I wanted to see what other patterns I might have overlooked that would work for my unique fabric. I had seen the Flora dress before but it didn’t really stand out to me at the time, probably because the dress on the model is cut fairly short and I generally stay away from those lengths on my frame- I also have a love/hate relationship with high-low skirts and dresses. But this time around, armed with a specific fabric in mind, the Flora dress pattern seemed like the perfect partner to my Brilliant Bouquet fabric. The pattern has wide pleats at the waist instead of darts, which, depending on my panel placement, was a must since I didn’t want to break up the line of the flowers if possible. I also thought that pleats would create a more interesting look with my full-bodied fabric than darts would. The bodice I chose for the Flora dress (there are two options) was simple and understated, which seemed like a nice contrast to the drama of the skirt, and I thought that keeping the flower print at the bottom of the skirt and having it complete before the start of the bodice would look nice. The majority of my mental concentration came when trying to place the skirt properly on the print. The skirt, which is essentially a 3/4 circle, is made of three pieces- one for the front which is cut on the fold, and two for the back. The waistband of the skirt is curved but the panel print is placed straight across the fabric, perpendicular to the straight grain, so trying to determine the smartest way to take advantage of pattern placement without having the line of the flowers broken up was nearly impossible. At this point I realized that having a dart in the skirt as opposed to pleats would have been helpful in terms of keeping the flower print continuous across the skirt. But ultimately I decided that the break in print placement could be an intentional design choice, especially coupled with the full folds of the pleats, so I forged ahead and cut out my pattern pieces as planned (but not before taking several deep breaths!). I am OBSESSED with the look of the main fabric contrasted with the printed lining, and I thought I could try it out with my Flora dress by lining the back skirt pieces with the main fabric so that the panel print was visible underneath, too, but, for several reasons, it didn’t quite work out. For one thing, my Brilliant Bouquet fabric has way too much body for a lining of the same material- it would have created even more volume and the pleats would not have formed properly. 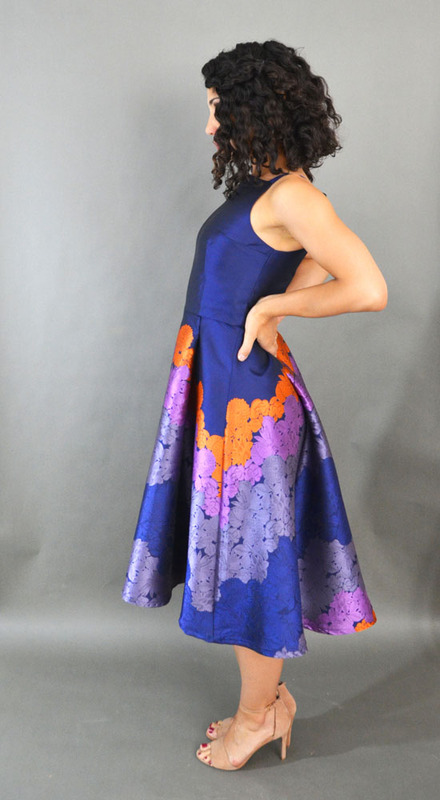 Secondly, the high-low length of the skirt of my Flora dress isn’t dramatic enough for you to see the lining beneath it- to accomplish this look I would have needed to make the dress almost floor length, and there was not enough room between the panel prints to accommodate that much fabric. 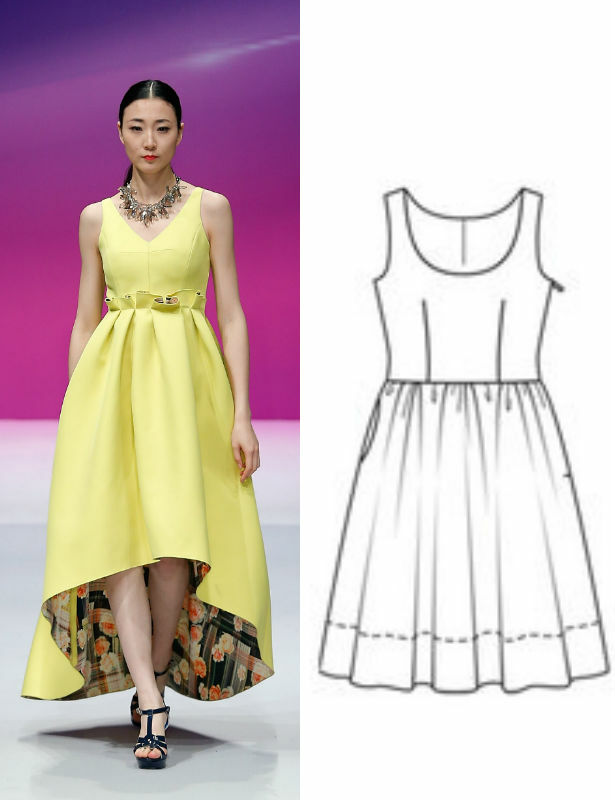 In the end, everything worked out for the best- I love how the Flora dress came out even without a special lining, and I am excited to try and recreate the above look on a future garment (and hopefully in that same lemon color because OMG it’s stunning). The only thing I wish I had done differently is put pockets in the dress, because they would have worked so well coupled with the volume of the skirt, and who doesn’t love pockets when they don’t interfere with the silhouette of a garment?? The dress is super comfortable and the fit is wonderful, which is an impressive feat for me since the entire thing was sewn in my temporary apartment in Savannah without a proper standing mirror or dress form- there was lot’s of arm-contortion involved when trying to get my zipper placement right, but I must say that I am getting pretty good at it!